The Power Filmmaking Kit joins a tradition of recent book + cd d.i.y. filmmaking packages like The DV Rebel’s Guide and The Shut Up & Shoot Documentary Guide but it beats its predecessors in sheer heft. Weighing in at 400+ pages, the book aims to be the complete guide through all stages of making a low-budget film. The author Jason Tomaric’s claim to fame is directing Time and Again, a “profitable, award-winning, internationally-distributed independent film made for under $2,000.” Unlike say, The Guerilla Film Makers Handbook, the author’s movie is included with the book, so you can judge for yourself whether it looks better than the reported budget. Only an hour hour long, Time and Again tells the story of Bobby Jones, a convict who, in the middle of escaping from prison, falls through a time portal to the 1950’s, to a day that lead up to his being wrongly convicted for murder. The movie takes an interesting detour — if you could sleep with your father’s mistress, would you? — but comes back to Bobby’s attempt to prevent his younger self from being framed. The movie itself is handsomely mounted for the quoted sum of $2,000. Clearly Mr. Tomaric and his collaborators were able to get essentially everything for free. The major coup was probably all of the classic cars and extras in 50’s era costumes. But the movie is not without anachronisms, even to a casual viewer, and a distributor would not be fooled into believing the movie had a big budget. Time and Again was clearly shot on video with non-actors. The lighting and camera work and sound are competent but not anything to write home about. “Hollywood quality,” as the book repeatedly claims? I think not. In any case, I appreciate the honesty of having the actual movie that is referenced in the book available to see what the result is of certain budget corners being cut. I actually believe that, given 2 million dollars and big name actors, the presentation of the story would not have been substantially improved. Jason Tomaric’s commentary is very literal, mostly covering what edits were cheating two locations together, or what problems were overcome to achieve individual shots and scenes. I think emerging filmmakers will sympathize and find some of his examples of how he digitally created certain coverage after the fact useful. Those filmmakers should also note that re-shoots are expensive, so avoiding them through more thoughtful pre-production is always preferable. The book begins with a chapter on writing. Tomaric’s approach is fairly formulaic, encouraging the filmmaker to work in established genres and use established structures. Nothing wrong with that; in fact it is good advice to give someone who is looking to sell their movie at the end of the process. He also encourages optioning material and working with a writing partner. Both of these are potential traps for a low-budget filmmaker. While some options can be had for $1, you still need to pay lawyers to draw up the contracts. Also, collaborating with a writing partner can sink a project if the collaboration goes sour. After all, you both own a piece of the material. Better to hire a writer — again, requiring a legal contract. Unit 2 is pre-production. This includes standard headings like Budgeting and Locations. What I haven’t seen in other books of this type and feel is very valuable is the chapter on Insurance. It breaks down the types of insurance available. In future editions I hope it is expanded to relate that there are currently very few companies who insure low-budget productions, and the cost of insuring them is quite high. There are ways to ‘umbrella’ under other companies, and certain non-profits exist for just this purpose. The book does include ballpark figures in the Crew and Equipment chapters, which is great and will be really helpful to inexperienced producers. Unit 3 covers production. The information on directing actors and acting techniques is great. Mr. Tomaric editorializes more when he covers different camerawork aesthetics like Dogme 95 and Cinema Verité. That chapter recovers quickly, thanks to some wonderful camera and lighting diagrams for scenes from Time and Again. Coverage is an interesting beast. You can always sense when it is bad. These diagrams go a long way towards showing how to break down complicated scenes with several lines of action. The Audio Recording section is good and includes a great recipe for a cheap boom pole. The Makeup chapter also includes some cheap recipes for prosthetics in addition to some basic makeup information that I haven’t seen elsewhere and found quite useful. Unit 4 is Postproduction. It goes all the way through editing and music to distribution. While there is nothing revelatory about the way distribution is discussed, it’s a good overview that sets the stage for more in depth books like The Insider’s Guide to Independent Film Distribution by Stacey Parks. The DVD contains the movie, Time and Again, several “Modules” which are much like behind-the-scenes featurettes you might find as bonus features on a special edition DVD (interviews with cast and crew about the making of Time and Again) except they emphasize filmmaking advice. Additional modules are also available after free registration on the website, powerfilmmaking.com. There isn’t anything in the modules that can’t be gleaned from the book, but I appreciate the fact that some people learn better visually than textually. If the modules have a flaw, it is that they contain too much PR-type material of the cast and crew praising each other and not enough emphasis on nuts and bolts details of filmmaking. The one time the modules do go into detail, in the “Intro to Editing” piece, the information they give is unhelpful and perhaps misleading. Mr. Tomaric shows his editing set-up — essentially the same one I was using circa 1999 — but says that Firewire hard drives are a “reliable” way to store the footage you are using to edit with. Putting aside the fact that a Firewire 400 drive is too slow for many indie workflows, any kind of hard drive can almost be guaranteed to fail. Only by having multiple drives in some sort of RAID array can access times and reliability be achieved. In any case, the cost of even Mr. Tomaric’s outdated setup is surely more than the entire quoted budget of $2,000 for Time and Again. The extra files on the disc are in two folders: Footage and Forms. The footage is a nothing inclusion, in my opinion, because it doesn’t have a license that would let people remix and post to the web or use on an editor’s reel. So you can practice editing a scene you didn’t shoot if you like. What’s fun about this is that it has notes and highlighting from the production. This is what I believe to be the treasure trove of the whole kit. Reading through these letters, you can see how Jason Tomaric was able to secure locations and equipment for free: polite, professional letters. There are also some pages from the newspapers that were used as props, distorted by the .pdf conversion, and invitations to the premiere as well as a sheet of the custom tickets used. Unfortunately, the .pdfs are an unhelpful choice in that they force you to remake the document yourself — or you can print it without customizing it and hand-write on it (not really an option in this time of email attachments). One can find example forms (of varying quality) free on the internet already — and you can edit them. It would’ve been better for the publisher to include everything in two forms, .pdf and .doc. This of course means people will file share… oooh. As of writing, the companion website, powerfilmmaking.com, does not appear to be fully operational. The layout looks weird until you register for the site. After a free registration, you are invited to create a social networking page, where you can list your film credits and the equipment you have access to. At time of writing, the Photo Gallery option did not appear to be working. As of writing, there were only 158 registered users, and the forums were bare. While it may in time come to rival established message boards like DVXUser, other than some additional modules not included on the DVD, it appears there is nothing on the website that can’t be had elsewhere on the net. 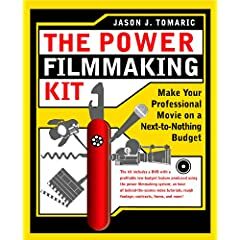 While I can’t recommend The Power Filmmaking Kit as the first and last book a filmmaker should buy, it certainly is a comprehensive overview of what it takes to make a small movie and it’s a heckuva lot cheaper than a university credit hour. I look forward to a second edition that improves upon what is a very good structure for learning about low-budget filmmaking. UPDATE 2011: Read a review of Jason Tomaric’s new website, Filmskills.com.